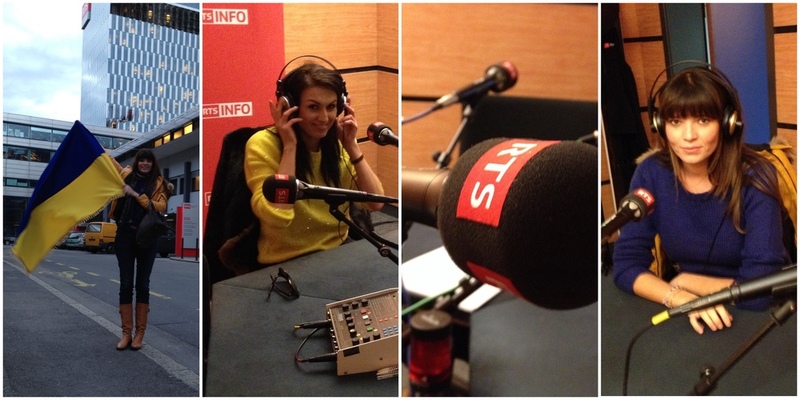 smoothly advanced into live interview on the Swiss National Radio RTS. Theme of radio discussion and the meeting is obvious, the situation in Ukraine. Swiss National Radio RTS: Our invitees are with us. Good evening, Iryna Parokinna. RTS: You have been living in Switzerland for 10 years now. The news that you are hearing from Ukraine, I imagine, are not great. Do you have any family or relatives, who are there in the place right now? IP: None of my family members are currently there, but there are some of my friends, who live in Kyiv and who work close to Maidan. And they are absolutely shocked by the recent events. And they do go to the streets to help people and victims. And indeed there is the ambience of war. RTS: It looks like there is a line that has been crossed, and if it is not a civil war yet, it is very close to being one. Do you think so as well? IP: I cannot call it a civil war, as civil war is when one part of the population of the country fights against the other part of this population. But now we have all the population of Ukraine fighting against the police force and Yanukovitch regime. RTS: When you hear accusations of the regime towards the people on the streets; the mobilisation is not centralised and there are different movements, and even extreme Right movements; do you agree with this critic? IP: I do not really agree with this critic, because these people there, they do not attack, they only defend themselves. They are not armed, contrary to the police, and they are just trying to protect their lives. As there we see not only men, there are women as well, and elderly people, and we can see there all sorts of people. And they cannot all be extremists. You cannot call a person in a wheelchair, that you see there, an extremist. RTS: Iryna Parokinna, you have manifested today in Geneva. And you think that Switzerland can do something, and something very important? IP: Absolutely. Switzerland can probably not stop the violence that is happening in Ukraine, but at least take a few steps that would lead to the end of this massacre. By simply freezing the bank accounts of Yanukovitch and oligarchs that are supporting and sponsoring this bloody regime, of the son of Yanukovitch, who has a company registered in Geneva. And it is pretty easy to do, as all these people worry only about money and that is their only interest. RTS: Iryna Parokinna, this is your call to Swiss politicians. There are as well European politicians, that are getting more active. As we said before, there are 3 ministers that are currently in Kyiv. And there is this agreement that just got signed in EU to sanction the Ukrainian governors, who are responsible for the violence. RTS: Iryna Parokinna, do you think imposing economic sanctions will be effective? After all there is a situation that requires urgent actions. And economic sanctions can take a long time to be put in place. Is it really what can help Ukraine right now, when there are already arms “speaking”? IP: As a first step, yes, that is something that can help a little bit. Everything that is going on cannot be stopped from one second to another, but sanctions it is something that can be a first step to stopping it. As well, the president requested a Russian representative to be present during the negotiations, but that is only HIS request. As Ukrainian population does not want Russian intervention into anything. They already intervened by sending their death squads, which is absolutely illegal. There were already lots of representatives of Russian police identified, who are killing Ukrainians. RTS: Iryna Parokinna, but there is no solution without Vladimir Putin. Like with Syria, there will be a necessity to get Russia’s agreement as well to find a solution. IP: From one side I understand it, but on the other side: its two different countries (Ukraine and Russia). Why somebody external should get involved into our internal problems? RTS: Iryna Parokinna, do you fear that after the Olympic Games in Sotchi, that are coming to the end at the end of this week, that Vladimir Putin will be even more present in Ukraine, as so far if he is present – it has not been official? IP: Absolutely. It is what we fear. And I am afraid that it cannot be avoided. Only if Europe and the entire world will help us and will tell clearly to Russia to back off and they have no right to intervene in Ukraine’s affairs, and if they sanction Yanukovitch and will tell to Putin to stay away, then we have a chance. Otherwise, the massacre will continue and we will have more and more victims and then we will be counting not tens and hundreds like today, but it will be thousands. RTS: Russia is an essential element to finding a solution and must be integrated into the negotiation. Is it painful to hear it, Iryna Parokinna? IP: It is. And I understand that Yanukovitch is not deciding it all by himself, it is Putin who is backing him up and tells him what to do and how to do it. And one of the requests of Putin was to clear the Maidan, in order for it not to influence Olympic Games in Sotchi in a negative way. And Yanukovitch did not manage to do it. And now Yanukovitch decided to put all his force to clear the Maidan, even if he has to kill everybody, as it is the request of Putin. RTS: Thank you very much. Iryna Parokinna, you are in our Geneva studio, do you have a message to Swiss regarding the situation in Ukraine? IP: The message is: Help us. Help Ukraine. Do something, as you have all the necessary powers to do it. We need it, as people on Maidan in Kyiv are standing not for integration with EU or anything else, but they are there for their human rights.